As I complete my Bachelor’s degree and graduate this November, I will take all of my achievements and successes that I have obtained that would not have been possible without the Honor Society. When I decided to go back to school and pursue my Bachelor’s Degree, I became overwhelmed with my class load and never thought I would finish. 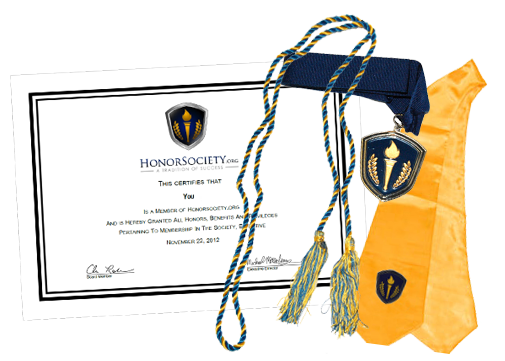 A few months into my online classes, I received an email stating I was accepted into the Honor Society. What was the Honor Society? Was this email meant to go to the spam folder? The thoughts that were going through my head were endless as I never had any sort of recognition in the past for my education. After researching that the Honor Society is indeed a preeminent organization, I quickly completed my application and saw the doors open in front of my very own eyes. From the health benefits offered, to many different scholarships, to monthly writing challenges, the opportunities are honestly endless when you become a member of the Honor Society. In high-school, I never pushed myself to the best of my ability. I was an average student with average grades. I never had a 4.0 and never got to wear the tassels for extra achievement at my high-school graduation. But this time was different for me. As a full-time employee while being a full-time student, I couldn’t stop pushing myself to be better and to keep a steady GPA for my entire college career. This could not of been possible without the empowerment that I received from the Honor Society. With four weeks left in my very last class, I have so many different emotions running through my head, but to name just one, this moment is becoming very bittersweet. Throughout my career at Spring Arbor University, I have kept a GPA of over 3.6, all while being a full-time employee and full-time, online student. I have won a number of monthly writing challenges and have sent in countless scholarship applications. With that said, my last achievement that I found to be very gratifying would be becoming an Honor Society Ambassador. During that time, I hope I have inspired others through my story so they can see that nothing is impossible. We can all do what we want if we set our mind to it and I know I am a walking billboard for my success. Honor Society has given me the hope that I needed to keep going. Before I entered the Honor Society, I was a great student, I got my homework done and did the best I could, but once a member, I felt I was on fire and that I could not be stopped. This dedicated organization has pushed me to the best that I can be. As I complete my Bachelor’s degree, my last Honor Society Ambassador assignment and that very last discussion post, I know I can say one thing, ‘I am proud of the person I have become, and I won’t stop here.’ The past three years have been a battlefield of ups and downs, overbooked calendars and a constant clicking of the keyboard. I have struggled with assignments, I was there to help my classmates but most importantly, I never gave up. As I leave the Honor Society and walk out of the doors of Spring Arbor University with my diploma in hand, I will never stop pushing myself, and I will never stop inspiring others. The Honor Society has inspired me to be great and I am truly thankful for that opportunity. Throughout the rest of my career, everything I have learned and everything I have earned will help me with my success. Have Your Best Spring Semester!